TESTING TIMES ~ Why Pray and Fast? So much is happening in our country! Have you noticed how many leaders in the past few days have used the phrase “our thoughts and prayers”? 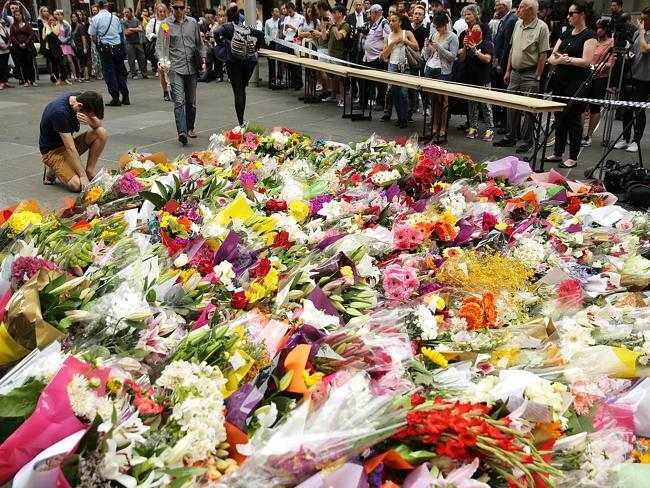 The Sydney Siege certainly has been a testing time for Australians. Many are not only grieving, but also questioning, confused, afraid and angry. The Canberra Declaration Update 116 from Tuesday addresses how we, as Christians, can respond to this tragedy by looking to the example of our Lord Jesus Christ. He gave His life as a sacrifice for others. He extended grace and forgiveness to His enemies. Let us pray that we can point others to Jesus at this time. Above all, the events of this week spur us on to pray and fast that Australia will come back to Jesus Christ and find its DESTINY in God. We have a famine of the Word of God in this land. As a nation we have rejected the one true and living God. More and more we are seeing the worship of false gods with their destructive ideologies and practices. The Martin Place terror siege is a symptom of our spiritual malaise. That is why we are calling the nation to prayer, fasting and repentance. Below you will find a short article called Why Pray and Fast? or you can read it here. Now is the time to prepare ourselves for the next National Day of Prayer & Fasting and 40 Days of Prayer and Fasting. If you haven’t registered yet, we encourage you to do so today. In your registration, you are asked to tick some boxes as to how you plan to be involved so we can send resources to help you. There is no fee to register but donations are gladly received. Today we want to focus on the pre-events to be held around Australia that will lead up to the National Day of Prayer & Fasting on 15 February 2015. These will be held from 7-14 February so giving many more Christians the opportunity to come together to pray and fast for Australia. These pre-events will also prepare the way spiritually for the National Event. Here are some examples of pre-events that are being organised so far. Queensland 7 February 10 am -4 pm – This will be the fourth event to be held in Parliament House, Brisbane. You can register for one of the 300 seats in the Parliamentary Annexe NOW. This pre-event will be very close to the State election predicted to be called early in February. 2015 NDOP Brisbane Parliament Details. Victoria – Details are still being worked out. Please pray. South Australia 7 February 10 am – 12.30 pm (normal Revival SA monthly meeting) SA House of Prayer for All Nations will host this event at the Adelaide Christian Centre, 27 Sturt Street, Adelaide. Contact Jenny Hagger or phone (08) 8370 1256 for more information. The ministry is going into a season of fasting from 1st January. Western Australia 7 February 7-10 pm – A city-wide evening prayer event will be hosted by Pastor Margaret Court at Victory Life Church in Perth. Contact Anne Edgar for more details. As yet, there are not pre-events happening in NSW, Tasmania, ACT or Northern Territory. If you have a contact in these states who you think we could approach to host one, please send their details to Marilyn at info@nationaldayofprayer.com.au. We have contacted the oversees territories of Norfolk Island and Christmas Island and Christians there are open to joining in. We haven’t got any contacts for the Cocos Islands or Antarctica! Do you know someone there? 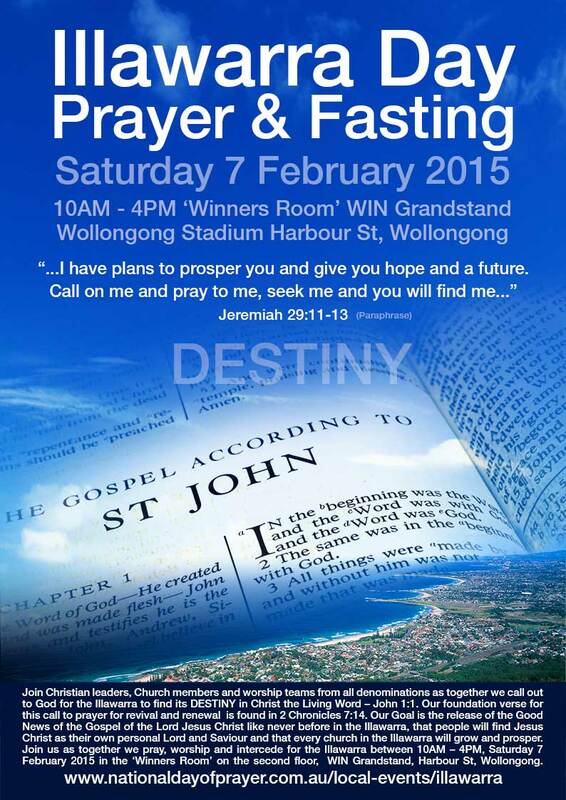 Illawara Region 7 February – Local Christian leaders will host a Day of Prayer & Fasting at the Wollongong Stadium from 10 am-4 pm. Click on the poster to see more details. Gold Coast City 13 February – Gold Coast House of Prayer will host a worship and prayer night from 7.30-9 pm followed by a night-watch till 7 am on Saturday 14 February. Gold Coast Pre-event 2015 details. Ipswich City 14 February – There will be a prayer meeting . For more details contact Lee-Anne Nelson, Administrator Ipswich Awakening, or phone 07 3812 1977. Toowoomba Regional Intercessors Group 14 February – For the fourth time this group will meet on the Saturday before the National Day to pray and fast. More details Annie Cathcart. Coral Coast, Queensland 15 February 3-5 pm – There will be a meeting at Coral Coast Christian Church (A Baptist Church Family) at 596 Windermere Road, Bargara on from 3-5 pm. All Christians in the area are welcome. Contact Pastor Brian Robertson for more details or phone 0407 547 036. Balcatta, Western Australia 15 February 12-3 pm – Churchlands Christian Fellowship will host a Prayer Service 154 Balcatta Rd, Balcatta. Please call 6241 2700 if you require further information. In their registration many have indicated they are willing to organise a pre-event in their area or local church. We are in the process of writing individually to them to get the details of what they plan to do. These will appear on the website over the next weeks at this page. You can add an event there in the comments. It doesn’t need to be a big event. If you have a church prayer group, a home group or a Bible study group, etc. you could ask if that week the meeting could focus on praying for Australia. We will send you resources to do when you register. Our greatest need at present is promotion of the National Day of Prayer & Fasting and its pre-events across Australia to churches and individuals. That’s where you can help us. Spread the word to as many as you can by as many means as possible. You may have received a DL flyer in the last Koorong catalogue. If you would like more of these to put in church bulletins or distribute to friends, you can order posters and flyers by filling in this form. If you would like to help us get the word out to new contacts, especially churches in your local area or in your denomination and you can’t do that yourself, then you could provide us with the details of churches in your local area or town or denomination. We can provide a master sheet to type the information into. We will then write to them. Please contact us now if you could help with this in the next month. Thank you so much. An army of volunteers doing this could make a big difference! We also need your prayer support and financial support. Our investment to call the nation to pray and fast, and provide support and encouragement for the many pre-events that are happening in 2015, is $120,000. We do not ask for a registration fee but rely on donations and offerings at these events. We are happy to report that we have received promises of $20,000 to date. As well as this, generous donors have offered a matching grant of up to $10,000. Every dollar given, will be doubled if $10,000 is received by Friday 16th January. Your gift of $50 would become $100. Your combined gifts of $10,000 would therefore become $20,000 which is what is needed in the next few weeks. We believe wholeheartedly that there is no greater investment in our nation at this time than investing in a national call for prayer, fasting and repentance. Please donate through GiveNow (preferred) or use this donate button for PayPal. At this special time of the year, we wish you a Blessed Christmas and joy as you go into the New Year. Trailer on ‘DEEPER‘ – A 30-min DVD on the story of the National Day of Prayer and Fasting 2014 with a bonus documentary called ‘The Power of Prayer’. You can receive a copy for a donation of $20 or more. This includes postage. Follow and share with your friends. Thanks. The truth is, prayer and fasting is for today! In fact, there is a desperate need for Christians to pray and fast at this time in our history. Many have never taken part or have been taught about prayer with fasting. As a result, they don’t know why prayer with fasting is so important; what the Bible teaches about prayer and fasting; or how to pray and fast. To many, prayer and fasting sounds like drudgery or a form of religious works. To others, it sounds extremely difficult. The combination of prayer and fasting is not a way to manipulate God to change a situation. Prayer and fasting are Bible-based disciplines which help us avail and align ourselves with the will of God. Prayer with fasting is appropriate for all believers, of all ages, throughout all centuries, in all parts of the world. The Bible has a great deal to say about both fasting and praying, including many commands to pray and fast. The Bible also gives us examples of people who prayed with fasting. They used different types of fasts for different reasons, all with very positive results. 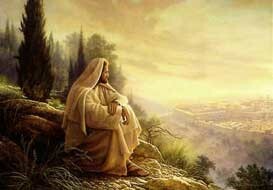 Many of the Old Testament heroes and heroines of the faith prayed and fasted. The followers of John the Baptist prayed and fasted. Jesus prayed and fasted and assumed His followers would do the same. When He taught about fasting in the Sermon of the Mount He said “when you fast …” (Matthew 6:16). Jesus’ disciples prayed and fasted after the Resurrection. Many in the early church prayed and fasted. What we see in the Word of God, others throughout church history, have modelled in their lives. This encourages us to do the same. Abstaining from meals firstly opens up more time to pray! Fasting is a spiritual discipline that helps us regain mastery over all things associated with our flesh. This enables us to place greater emphasis on spiritual matters. As a result, we draw closer to God as we overcome the flesh and put all carnal temptations into subjection. Those who fast often experience a clearer understanding of God’s Word and a greater discernment of good and evil. God gives us an opportunity as we fast to take a look again at our lives and the world around us and to discern what really is happening in the spiritual realm. We have a heightened awareness not only of God’s goodness and of God’s commandments, but also of the evil that abounds in the world around us. Breakthrough might be at a personal level in the realm of emotions or personal habits, relationships or finances etc. But prayer and fasting can also work on a much grander scale. According to Scripture, when God’s people pray and fast with the proper Biblical motive of seeking God’s face with a broken, repentant, and contrite spirit, God will hear from heaven and heal our lives, our churches, our communities, our nation and our world. Prayer and fasting can bring about revival – a change in the direction of our nation, the nations of earth and the fulfilment of the Great Commission. Prayer and fasting helps us to get ready for, and perhaps even hasten, the return of Christ! Periods of prayer and fasting can produce great spiritual results and much needed breakthrough! Third-world churches today that are seeing phenomenal church growth make prayer and fasting a regular discipline. Many thrilling accounts and helpful books have been written on prayer and fasting. You can find resources to help here. 40 Days of Prayer & Fasting page – Why Pray and Fast?